The famed GST or Goods and Services Tax rolled out on 1 July 2017 with the objective of “One Nation, One Market, One Tax”. Ultimately, many indirect taxes ended by implementing GST, which is a much simpler taxation process. 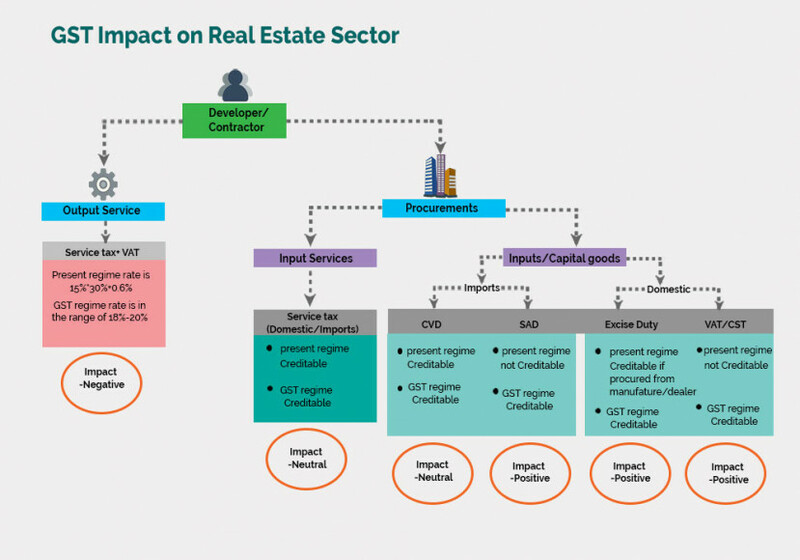 Financier, developer, intermediary, buyer and seller, or an investor, everyone dealing in the real estate were impacted by the GST in many ways. But we will now discuss how GST has affected the buyer. We are still in the early stages of implementation of GST and it is hoped that this new step will promote the industry by bringing more transparency in the taxation process. The taxation process has been too complicated for buyers and sellers for too long. Earlier buyers were taxed depending on the construction status, the location of the property, VAT, service tax, stamp duty and also registration charges on purchase of an under-construction property. On the other hand, a completed property attracted stamp duty and registration charge but the VAT, stamp duty, and registration charges were levied by the state and each state specified its own numbers. Service tax was a central government tax which was charged on construction. So the calculation of taxes was very tedious in the earlier regime. GST has changed the game as all the charges of under-construction properties will be levied at twelve percent of the property value. This does not include stamp duty and registration charges. No indirect tax is applicable on sale of ready-to-move-in properties, hence the tax will not apply to those. The biggest takeaway is that GST is a simple tax that applies to the overall purchase price. A developer could take input credits on the sale of under-construction property against the taxes that are paid by the buyer. Earlier, VAT and service tax accounted for nearly nine percent of the ticket price of the property. Since that will be lower than the GST applied to the sector, the builder will have to pass on the benefit of the price reduction to the buyer. The price reduction is on account of the input tax credits that the builder enjoys. Daiwik Housing appreciates the measures taken by the government to simplify the taxation process. To allay your fears over whether developers will pass on the tax credit benefits to you, the government has proposed anti-profiteering measures also. Daiwik Sparsh offers a healthy, active and enjoyable life with contemporary facilities by providing comprehensive and user-friendly homes. Our project also offers highly trained professional security services with multiple level security arrangements and state of the art amenities like Gymnasium, Senior Citizen Avenue, Private Gardens, Paved Roads, Recreation Areas, Club House, and Outdoor and Indoor Sports Facilities. In addition, one of the key differentiators is our location – Whitefield. We encourage you to take advantage of this transparent and hassle-free tax era. To know more about Daiwik Housing and our projects, visit our website.